I found this recipe on a blog that I follow. It looked easy so I decided to try it for dinner. My boys loved it. It seemed a little dry, and I like my food more saucy. When I made it again, I doubled sauce for the recipe. It was better, but it still seems like it is missing something and I can’t quite put my finger on it. How I changed it: I doubled the sauce. Will I make it again? Most likely because it was a hit with my boys. Let eggs, butter, and cream and stand at room temperature for 2 to 3 hours. Cook bacon (we lay it on a pan and cook it in oven at 375 for 20 minutes or 400 for 10). Drain grease from bacon. Beat together eggs and cream just til combined. Cook pasta. 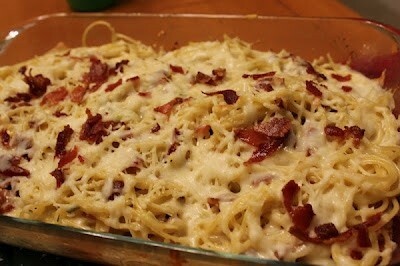 Turn hot pasta into serving dish (we use 9×13). Toss pasta with butter. Pour egg mixture over and toss til pasta is well coated. Add bacon, cheese and parsley, toss to mix. Put in oven at 350 for about 10 minutes to cook eggs completely. I added sliced black olives and sliced mushrooms. It was already a great casserole and this just tweeked it a little. I use to get Pasta Carbonara at a restaurant near me. It had mushroom and English peas in it. Loved the mushrooms, but hate peas so I would always push them to the side.